I entered a casting that had an art theme and thought how fun it would be to use Paisley Daisy’s “Eye Love You” Dress. Now you know with a name like that, the dress is bound to be fun to wear and style! The dress, as designed, is sleeveless. I added some striped sleeves from an old role-play day gown, from 4 years ago, to the dress and loved the looked. I put on a favorite pair of shoes of mine, “Wrapped Heels” from Enfant Terrible and really loved how they looked with the dress. As you can see, Eye Love You, is a playful, colorful, eye catching, artsy dress. You will have as much fun wearing it, as I do! Its a head turner!!! Eye Love You Dress is from a new line, The Art Dept. Collection, by Paisley Daisy. Art based clothing is a new trend, on the runways, that is getting hot! Be in the current, when you wear Paisley Daisy’s Eye Love You Dress!!! I graced the regalness of Sakura, with the exquisite headpiece by Silvery K. I first learned of this awesome store, when Miss Virtual World, Angelica Carling, generously gifted each Miss with a glorious headpiece from this store. My mouth dropped when I saw it! Their work is utterly superb. The Silvery K Head Dress, Sakura japon Red, is available at Japan Fair 2014. You should hurry to grab these, as Japan Fair 2014 ends April 20th! The Pouf and gaily topped End table were placed outside for a nice seating area on the porch. Boho styling, for home decor, is still hot and going strong! I do not think it will ever go out of style, because we love to mix and match patterns, use different accessories that do not necessarily go together, display things that mean much to us, and color…we love to use lots of color! Boho, which is short for Bohemian gets its inspiration from India and Morocco influences. 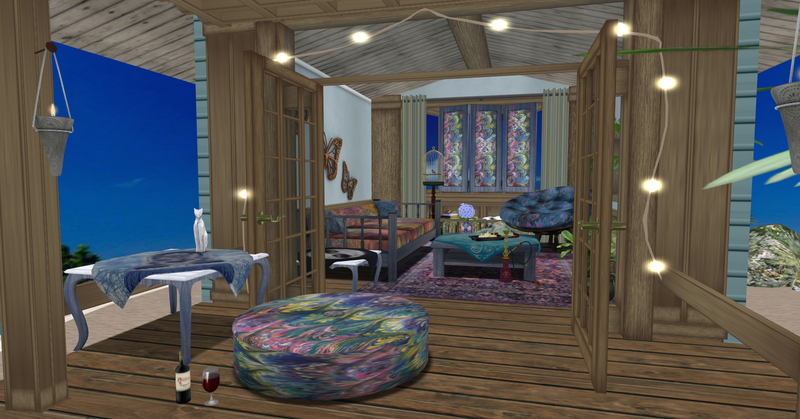 There are many styles of Boho, such as Gypsy, Indie, Hippie, Bohemian, Hipster, to name a few and is quite easy to do, layering fabrics, colors, and throwing in a bit of art like creator, Kyra Ishtari, owner of Serendipity Designs, has done with her latest design “Boho Fabulous Living Room”! The colorful patterned Sofa and Flutterby Wall Art, and side draped End Table. The beautiful Papasan Chair and Screen. The delightfully covered Coffee Table with accessories and the glorious Oriental Rug. 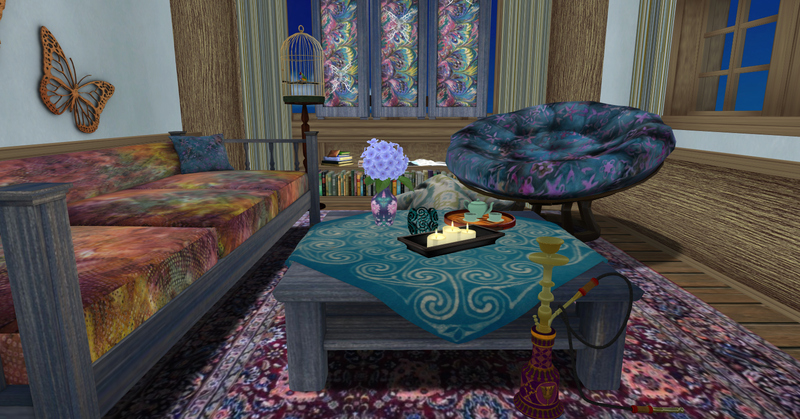 The Boho Fabulous Living Room Set, I have, has a Oriental Rug, Flutterby Wall Art, Screen, Papasan Chair, Sofa, Pouf, 2 End tables, and a Coffee table. I just love her use of color patterns, for this set! An amazing mix of decor, most definitely! 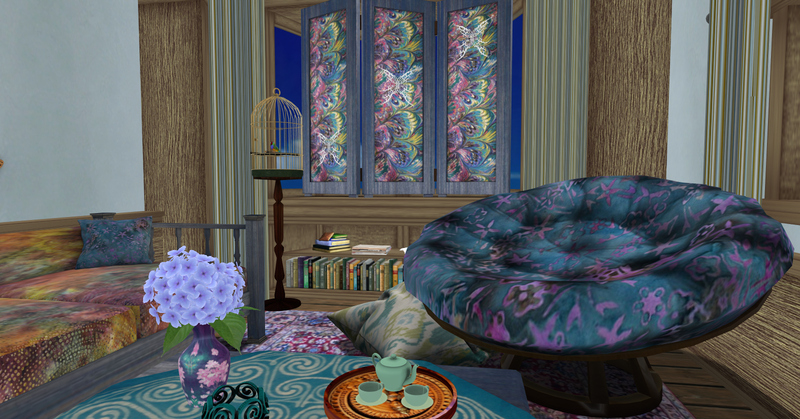 I was asked, once, why I never use a small space to decorate, as many have small homes, similar to the Linden 512 size. So I took Boho and put it in a small space. It looks boholicious!!! Kyra has taken unique accessories, patterns and textiles, bold/muted colors, and art, and mixed it. The style’s looks completely effortless and unplanned! This is hard to achieve, but she has done it! Her use of unique things, such as the water pipe near the table, is unexpected but totally fits the vibe! Nothing matches in this grouping of furniture, as though it was just thrown together, yet it looks so cohesive and desirous as a set! That is a awesome talent to have, in decorating, and Kyra has this in abundance, as you can see! Boho Fabulous is a very eye appealing, eclectic, chic bohemian look! Why not get your Boho mojo going and visit Serendipity Designs! Sometimes life is so fragmented, in so many pieces, that we cannot see the whole of it. As we stare at the many pieces, we forget to see the beauty that the picture of our life presents. These very thoughts came to mind as I stared at the artistry and elegance of The Mosaic Gemstone Gown by Paisley Daisy. The many tiny pieces of this gorgeous texture comes together, in a beautiful pattern, that will do nothing ,but make you feel and look exquisite when you wear it! This incredible gown comes also in the Fitted Mesh, as well, and has a optional sheer overskirt. The intricate pattern adds up to one dazzlingly, charming, striking gown! Attention will be yours to command, no doubt, when you enter a room in this gown. The shimmer of the tiny gemstones, will mesmerize and make you an enchanting beauty, that will not soon be forgotten! The Mosaic Gemstone Gown is available at Paisley Daisy’s BOSL Renaissance Galleria Location and at her main store. Dare to be unforgettable in Paisley Daisy Mosaic Gemstone Gown!